Don’t wait – vote in the Alaska General Election beginning today, October 22. Candidates for Alaska Governor, U.S. House, 40 State House and 10 State Senate seats, and Ballot Measure No. 1 “An act providing for the protection of wild salmon and fish and wildlife habitat” will be on the ballot for the general election. 2. Absentee Voting By-Mail – deadline October 27 for ballot request. By Fax:The division will send a by-fax voting packet that contains a ballot, Voter Certificate and Identification sheet and instructions to the fax number you provided. You will need a witness over age 18 and a Fax machine. 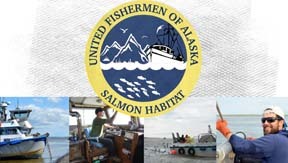 Prepared by United Fishermen of Alaska staff. To support our work see http://www.ufafish.org/become-a-member/.